- A raw 77-minute live performance CD, coming out on Gingerbread House Records in April 2004. Click here to download the full MP3! (77min, 68mb @ 128kpbs). 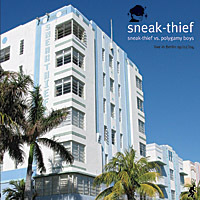 Original tracks by Sneak-Thief & Polygamy Boys performed live with synths & samplers (no vinyl or cd) by Sneak-Thief & Lindsay-J at Haus 13 in Berlin. Now for sale at the new Lasergun Records Store.